The problem: You have a shared mailbox in your profile and Send as permission on the mailbox. When you send a message from the shared mailbox, the sent message goes into your own Sent Items folder. By default, sent messages are stored in your own mailbox, not the shared mailbox and the DelegateSentItemsStyle registry value is used if you want to store the messages in the shared mailbox Sent Items folder. If your mailbox is located on Exchange Server 2010, or on Exchange 2013 CU9 or newer (including Office 365 Exchange Online), the Exchange administrator can configure Exchange to save sent items in the shared mailbox automatically. The benefit: you don't need to add DelegateSentItemsStyle to the registry on every computer that uses shared mailboxes, it just works. 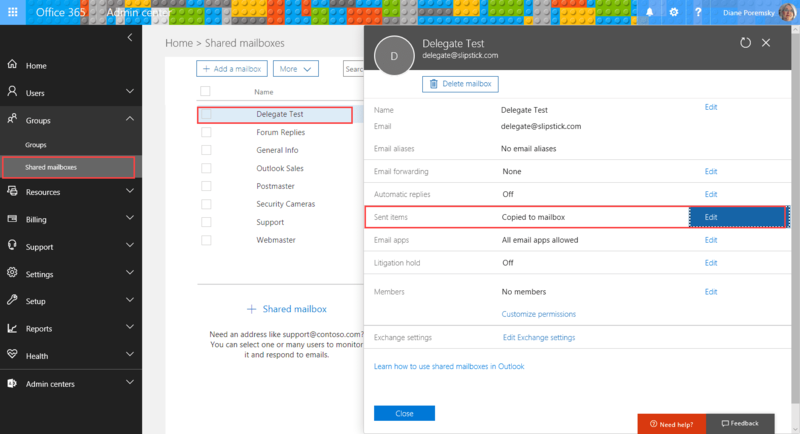 Beginning with Exchange 2013 CU9, when a message is sent from a shared mailbox, the sent message can be stored in the sent folder in the shared mailbox without adding DelegateSentItemsStyle to the registry. Yes, it's been a long time coming, but finally, all shared mailboxes will retain a copy of emails sent from the mailbox. This setting can be enabled or disabled in the Office admin portal or using PowerShell. Change the settings then Save and close the dialog. You can only use use these parameter on shared mailboxes. If you have Send as permissions on a user's mailbox, you need to use the DelegateSentItemsStyle registry key. Update Rollup 4 for Exchange Server 2010 Service Pack 2 introduces the Exchange PowerShell cmdlet, Set-MailboxSentItemsConfiguration , giving the administrator the ability to configure which Sent Items folder a message is copied to. Because this new feature is handled by the Exchange server, Outlook can be configured for Online or Cached Exchange Mode. However, the Exchange server feature only works if the Outlook DelegateSentItemsStyle registry value is disabled. If both settings are enabled will it cause a conflict? If it is enabled on the server and you set the DelegateSentItemsStyle registry key on the client, you may experience weird behavior and saving sent items may not work as expected. Thank you for keeping this updated! I came back here for the powershell commands, and I see it is built-in to the admin center now. Awesome! I have two customers ( different O365 tenants ) for whom I have performed this change. It worked but now I can see that the sent items are saved in both shared mailbox and the primary mailbox. Anyone else that seen that so far? I mention that the reg key for Outlook wasn't set and is not existing. If you have any hints - I'll be happy to listen :). By the way - the article is really well explained. That is how it works... MessageCopyForSentAsEnabled copies it, it doesn't move it. Good news - this feature can now be set in the user interface of Office365 rather than having to use PowerShell. 3.Turn on "Copy sent as this mailbox" & Copy sent as behalf of this mailbox" and SAVE. For the command "set-mailbox mailbox-name -MessageCopyForSentAsEnabled $True"
I'm assuming 'mailbox-name' would be the name of the box we're trying to set this for? I'm fairly green on using the Powershell. it would be the shared mailbox name. HI Diane, I seem to connect to the Exchange online server fine and when I type Get-Mailbox I see several mailboxes that look familiar. In the results of that cmdlet it shows 4 columns...Name, Alias,ServerName and ProhibitSendQuota. My question is the name in the first column is what must be substituted into the cmdlet you have provided i.e "set-mailbox mailbox-name -MessageCopyForSentAsEnabled $True" should then become "set-mailbox XXXXZZZZ -MessageCopyForSentAsEnabled $True". Many thanks. Is there an equivalent command for deleted items for Office 365 since they also save deleted messages from shared mailboxes to the user deleted folder rather than the shared mailbox deleted folder? I followed the instructions in this article and the one below however the SENT Items behavior did not change. I checked the workstation to make sure the registry key was not present. I am using an actual "shared" mailbox. Any ideas? What version of Exchange are you using? If not Office 365, are all updates installed? O365 has added the feature to enabled for individual shared mailbox under setting for the page. For Office 365 enabling of sent items on 'all' shared mailboxes, that command does not work. The error I get says Invalid filter syntax. What is the correct syntax that worked for you? That is the correct cmdlet and syntax. Does Get-Mailbox (nothing else, just get-mailbox) return an error?